Never mind the economic turmoil at home and abroad; the luxury sector is expected to post double-digit growth this year to 191 billion euros, due in no small part to the growing appetites of affluent Chinese consumers. 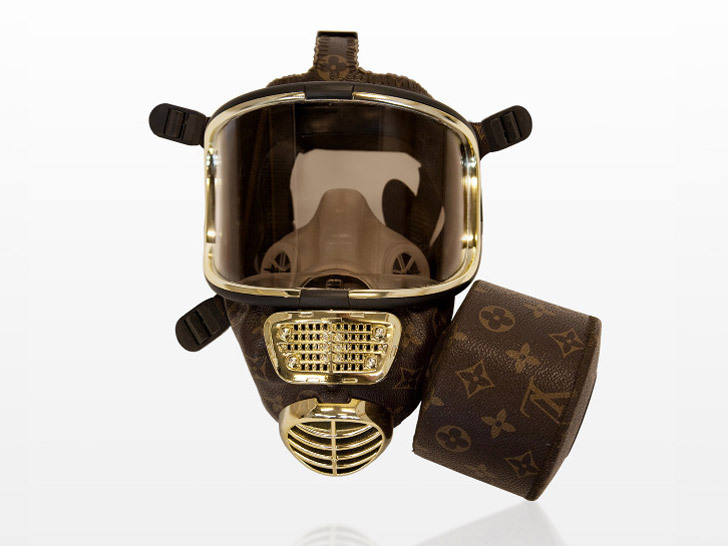 A series of designer gas masks by conceptual artist Diddo Velema explores the psychological comfort we derive from high-end goods in the face of imminent disaster. Decked in the iconic logos of Chanel, Gucci, and Louis Vuitton, the masks offer a critique of our “collectively insatiable culture of consumption,” according to Velema. “Because it is only by first acknowledging and then challenging fear that we will all be able to breathe a little easier,” he adds. Never mind the economic turmoil at home and abroad; the luxury sector is expected to post double-digit growth this year to 191 billion euros, due in no small part to the growing appetites of affluent Chinese consumers. A series of designer gas masks by conceptual artist Diddo Velema explores the psychological comfort we derive from high-end goods in the face of imminent disaster. Decked in the iconic logos of Chanel, Gucci, and Louis Vuitton, the masks offer a critique of our "collectively insatiable culture of consumption," according to Velema. "Because it is only by first acknowledging and then challenging fear that we will all be able to breathe a little easier," he adds.